I make clear at the outset that I offer no comment whatsoever on this particular case. While the editorial slants of the tabloids may hint at two-fingered salutes to the law of “strict liability” contempt of court, I am going to play safe by disclaiming that, as criminal proceedings in this case are “live” within the meaning of Schedule 1 of the Contempt of Court Act 1981 (a suspect having been arrested without a warrant), what follows is intended as a contribution to a discussion in good faith of public affairs or other matters of general public interest. What I want to look at briefly, therefore, is the law of self-defence in what lawyers euphemistically refer to as “householder cases” – where force is used by a householder against a trespasser in a dwelling. In dipping into this legalese, I do not for a moment seek to minimise or cloak the stark reality that confronting a burglar in your home is one of the most terrifying experiences imaginable. Burglary of somebody’s home is an offence which, in my view, is treated with relative disdain by the criminal justice system. Its ubiquity means that insufficient resources are made available to police to investigate (hence shocking reports of 9 out of 10 burglary investigations being closed without a suspect being identified). Its prevalence means it is considered by the CPS to be one of the least serious criminal offences for the purpose of instructing prosecuting barristers, attracting a miserly fee (£480 for a 2-day trial requiring on average 20 hours’ work (2 days at court plus a conservative 4 hours’ preparation), so around £24 gross an hour, of which I would take home about £12), and is therefore prosecuted often by the least experienced in our ranks. And, while I am not one predisposed towards longer sentences, I have a lot of sympathy with members of the public who feel that a Sentencing Guideline starting point of 1 year’s imprisonment, of which a defendant will serve a maximum of 6 months, does not adequately reflect the harm done by the violation that breaking into someone’s home represents. The after-effects can last forever. It is not a mere property offence; it is an encroachment into a person or a family’s safest space. And I think many of us in the system can become inured to that truth. So there is my opening salvo: I hold no affection for burglars. Don’t allow the clinical nature of what follows to lead you to think otherwise. But, since the tale of Tony Martin in 1997, elements of the press and the Conservative party have become fixated on the notion that an Englishman’s home is no more his castle; that, confronted by an intruder in the dead of night, the householder is required to deferentially hand over the code to the safe and ensure that the burglar is safely escorted from the premises with his bag of swag bulging and his bodily integrity intact. What followed, under the intellectual guidance of Chris Grayling, was a change to the law in 2012 seeking to persuade Middle England that, in the words of the prematurely-celebratory Sun headline, “It’s Official: You Can Batter a Burglar“. We’ll have a look below at what that means in practice. It is a longstanding principle of English common law that a person is entitled to use reasonable force in self-defence, or in defence of another. There are also statutory defences of using reasonable force in defence of property or in the prevention of crime and arrest/apprehension of offenders. The first question that a jury must ask is Did the defendant believe or may he have believed that it was necessary to use force to defend himself an attack or imminent attack on himself or others or to protect property or prevent crime? The second question is Was the amount of force D used reasonable in the circumstances, including the dangers as D believed them to be? The burden is on the prosecution to disprove self-defence. It is not for a defendant to prove that he was acting in self-defence. The prosecution have to prove beyond reasonable doubt (so that a jury is sure) that the defendant was not acting in reasonable self-defence. Let’s break down what this means. The question here is subjective – i.e. did the defendant genuinely believe he needed to use force in self-defence? It does not matter if the defendant was in fact mistaken, as long as he believed that at the time. So if a 6-foot man wearing a terrifying bear costume runs towards you brandishing what looks like a machete, and you genuinely believe he is about to attack you, the fact that you later realise the “machete” is a hunnypot and that you’ve KO’d Winnie The Pooh in front of a distraught crowd of Disneyland toddlers does not matter. The fact that your belief in the need for force was, by objective standards, unreasonable – who would mistake a hunnypot for a machete, for Lord’s sake? – does not matter at this stage. It might make the jury less likely to accept your insistence that your belief was genuine; however the bottom line is that a mistaken, unreasonable but genuinely-held belief in the need for force is enough. (The only exception is if your mistaken belief is due to your voluntary intoxication. Because, frankly, getting tanked on Stella and raining fury on Winnie The Pooh in a fountain is not something the courts can condone). Further pointers in section 76 include the provision that if force is “disproportionate”, it cannot by its nature be “reasonable”. Which sounds self-evident, one might think, but we’ll come to this more in a second. It is also made explicit that, while the possibility of a defendant having been able to retreat is a factor to consider when assessing reasonableness, there is no “duty to retreat”. It is also long-established that a person may strike pre-emptively – you do not need to wait to be hit. So in a nutshell, the law of self-defence means that the prosecution must make a jury sure that either a defendant didn’t really believe he needed to use force, or that he did but used unreasonable force – for example killing someone with a gun in response to a slap to the face – bearing in mind the broad scope of appreciation allowed in these cases. Quite how Mr Cameron intended to guarantee that fetter on the discretion of the independent Crown Prosecution Service was never explained, but the public was thereafter treated to Chris Grayling’s party piece at the Conservative party conference, which went someway beyond Mr Cameron’s hashed restatement of the existing law. And, as you might expect, Mr Grayling’s idea was as poor in execution as it was stupid in policy. Grayling, having dissembled to the crowd about what the existing law of self-defence said, insisted that a new law was needed which changed the test. No longer was “reasonable self-defence” a sufficient litmus. Instead, householders should only be convicted where they had used “grossly disproportionate” force. Merely “disproportionate” force, it followed, was no more than burglars deserved. Section 76(5A) was duly inserted into the Act. Inevitably, once reality bit, Grayling’s dreams came crashing down around him. He lost the support of the Mail once they saw guidance sent to judges and prosecutors “admitting that the provision does not give householders free rein to use disproportionate force in every case they are confronted by an intruder.” (You can just hear the disappointment jumping off the page). The exemption did not apply to the use of force to protect property, for example. Nor did it apply to “non-dwelling buildings”. So if you saw someone stealing your lawnmower from your shed, you could not use disproportionate force to stop them. But worst of all, when the High Court was called upon to interpret section 76(5A), it confirmed that its drafting did not in fact have the effect that Grayling had desired. The CPS had interpreted s.76(5A) in accordance with the newspaper headlines – only where the prosecution could prove grossly disproportionate force would it be appropriate to prosecute. But the High Court said otherwise: all the new law did was to confirm (as if confirmation were needed) that anyone using “grossly disproportionate” force could not, by definition, be using reasonable force. Force which was “merely” disproportionate could be reasonable in householder cases, but would not always be. The test, as with all cases of self-defence, remained whether force was “reasonable” in the circumstances. So, in conclusion, where a householder is confronted by a burglar, if they genuinely believe they need to use force in self-defence, they can use such force as is reasonable in the circumstances. If they use “grossly disproportionate” force, they cannot rely on self-defence. If they use merely “disproportionate” force, that may or may not be reasonable. Got it? If not, you can blame Grayling for the unnecessary confusion injected by the pointless test of “gross disproportionality”. Much has been made about the fact that the 78-year old householder in the present case has been arrested and (presumably) interviewed by the police, before being released. It is worth remembering that the police have a legal duty to investigate cases where there has been a loss of life. Part of the investigation may involve arresting a suspect so that they can be interviewed. Whether an arrest is necessary in a given case – as opposed to inviting a suspect in for an interview – depends on whether certain statutory factors have been satisfied. But on its face, there is little unusual in the police arresting somebody suspected of killing another person. The police will usually have a reasonable suspicion that a crime has been committed – because somebody has died a non-natural death – and the arrest will usually be necessary to allow a prompt and effective investigation, the combination of which means that an arrest is permissible. It is no indication of whether a charge will follow; rather it is on its face the police complying with their legal duties. When a suspect is arrested and detained at a police station, they have a panoply of rights, including the right to independent legal advice. If they are interviewed under caution (as one would expect), they will have the opportunity to advance any account of self-defence, which will then form part of the file that is passed to the Crown Prosecution Service for a charging decision. in discouraging vigilantism and the use of violence generally. There is often a degree of sensitivity to be observed in such cases; this is particularly important when the alleged victim of an offence was himself/herself engaged in criminal activity at the relevant time. For instance, a burglar who claims to have been assaulted by the occupier of the premises concerned. Upon inspection of most of the tabloid’s causes celebres, one will often find a fairly sensible explanation for a decision to prosecute a householder who has injured or killed a burglar. Sometimes, as with Tony Martin, the homeowner will have used lethal force on a burglar fleeing the property, or will have chased him down the street and given him a sound thrashing. The bottom line, as has always been the bottom line notwithstanding the dishonesty of Chris Grayling, is that using reasonable force against a burglar will rarely result in a prosecution, much less a conviction. This entry was posted in Bad Law, Lawsplaining and tagged Burglars, Courts, Crime, Law, Self-defence. Bookmark the permalink. Thank you for this piece; it’s interesting to read from someone at the coalface after seeing the usual penny dreadful headlines. There may – or may not; it’s been a long day – be a wee error in the final paragraph: “the burglar will have used lethal force on a burglar fleeing the property”; should that first “burglar” be “householder”? Apologies for being one of those people! Is Chris Grayling clinically stupid? “the intellectual guidance of Chris Grayling” – I’ve never seen an oxymoron in five words before today. May I ask about the theoretical case of a man in his late sixties (as, coincidentally, I am) facing a burglar in his home (as I thankfully, have not). He knocks the burglar down, but can be pretty sure that when he gets up again, being younger and fitter than the householder, he will knock seven bells out of him. How might the courts react to our sixty-odd-year-old giving him another precautionary thump or two just to make sure that he stays where he is least danger, unconscious on the ground? The Secret Barrister is far too nice about Mr Grayling. What he did to the judicial system was akin to a constitutional smash and grab raid, with truly terrible and lasting consequences for many. It in some way excuses him to suggest that what he did was the result of ineptitude or even sheer stupidity. However limited his intellect undoubtedly is, he revels in undermining the foundations of everything that he perceives as impervious to corruption or improper influence, and seeking to dismantle the statutory counterweights to abusive ministerial power, as he knows that is the only way to open the door to interference in due process and the peddling of politically motivated interests. I too was amused by the Grayling oxymoron, if not by his continuing existence. Do the police EVER arrest someone (and particularly in these type of cases) on “suspicion of manslaughter”? Or is arrest on suspicion of murder the default setting when someone has been killed (possibly in self defence)? Anyone else have a view on this potential aid to OR management? For the North Americans one distressing aspect is the difference in terminology and procedure. An “arrest” is a serious step and investigations and interviews can proceed for a long time before any arrests are made. The Mueller investigations being an example where arrests take a substantial amount of time. The aphorism about being divided by a common language (extending to culture and law in this case) being rather apposite. As you note the public disagrees strongly with the legal profession about the seriousness of house breaking, the validity of using force to protect property, when a threat is no longer present, and “unreasonable” force. Politicians want to appeal to the public while not going against the widely held views of the bar and the judiciary, leading to sham changes in law as you describe. It is my (obviously unreasonable) hope that politicians would comprehensively change the law, sentencing guidelines, and the processes of police and prosecutors to much more closely match the public’s sense of justice and how the legal system worked in the UK up until relatively recently, instead of the current travesty that only Jeremy Corbyn could support. The number of weeks handed out as current sentences would be fine if they were the number of years convicts were sent down for. Having a dead or wounded burglar on your property being cause for the thanks of the local constabulary rather than an arrest and referral to CPS. The concept of joint venture being applied to criminals such that if several individuals conduct a burglary and one dies thanks to a homeowner or police, the rest of the conspirators are prima facie guilty of murder and are pursued in court rather than the homeowner. I’m sure that the learned author and other readers are appalled by my uncouth and obviously below stairs attitudes. The disdain for the lay public and their opinions, regardless of reasoning or education, is a serious detriment to the legal profession being able to effectively put its point across. Justice is mentioned constantly, but only in the context of the settled opinion of the legal profession. When the public doesn’t believe that you deliver said justice, when you routinely belittle our concerns while demanding our cash as a moral imperative, our sympathy is, shall we say, limited. 1) Something of a pipe dream, but if new media would switch from “arrested for murder” to “arrested on suspicion of murder”, perhaps we can move away from assuming that this OAP is going to prison, or more generally that all arrested people are guilty. 2) Surely among the reasons for a murder investigation must be to establish whether a burglary took place? If not then if I ever want to kill somebody I’m doing it in my own house and claiming the victim broke in.My source for this thought is fiction (Rumpole and the Golden Thread) but similar things must surely have happened in life, old war veteran, infatuated with young ex-con’s girlfriend invites the lad round for drinks, shoots him and claims reasonable self defence. Excellent piece. Helps me understand. Thank you. Very informative, thanks. ‘Reasonable’ must be the difference between attacking (electrocuting, shooting, poleaxing) an intruder without warning and chinning him if he refuses to leave when asked. But then, I live in Scotland. So how do I beat the menopause without HRT? Just kidding. Wonderful piece (but then your blogs always are). Nice to be able to read a factual and straight forward explanation of the law regarding the use of reasonable force in such circumstances. People forget that each case is different and the facts have to be judged on their own merits. Obviously any violent death has to be investigated. Where’s the reasonable grounds to suspect that a crime has been committed by the householder? So if I am reading Section 76(5A) the amendment simple confirmed existing law? Brilliant piece of legislation. I remember reading the appeal decision in the Tony Martin case. Do many “defendants” in the UK do their best to get convicted? It doesn’t matter if nothing actually changed. What matters is that Something Was Done, pursuant to the Something Must Be Done Act 2014. Presumably this applies only in public. One is entitled to become intoxicated in the privacy of one’s own home, and if that means one’s judgement of the threat posed by a genuine intruder is impaired then surely that is the intruder’s hard luck! If there is a legal principle that an assailant must “take their victim as they find them”, e.g. the famous eggshell skull case, in which a fairly modest blow to the head was fatal, shouldn’t there likewise be a converse rule, where the potential vulnerability goes the other way, in that an intruder must take a householder as they find them?! In circumstances such as the one in question where, prima facia and in the first instance, it seems death has been caused as a result of self defence and the killer is willing to attend a police station voluntarily and he or she is willing to allow police access to their home etc. how can arrest be justified? Especially if the killer is elderly and is sole carer for a vulnerable person. I realize there is a low bar here and making an arrest is so much easier for the police but such an act must, one imagines, add very considerably to the stress and distress of the burglary victims. As such it seems to me if arrest can be avoided it should be. Chris Grayling should have his picture placed in the Oxford dictionary under the term fuckup. I think by the time he finally pops his clogs, particularly fiendish quizzes will bear the challenge to name something in government that Chris Grayling has not spectacularly failed at. Thanks for this fantastic piece. So the law is still pretty sensible about it, despite Mr. Grayling and the Daily Mail. I do have an interest here: I’m not ‘the general public’ and a court would make a much closer examination of my actions and my judgement, than they might otherwise do, if I were involved in such an incident. You will be happy to hear that your informal opinions and the general advice that you have given are, as far as a layman can tell, entirely consistent that the detailed and specific legal opinion given to us. Even a police officer can be intimidated and feel that her own safety or that of her family are threatened. I am not convinced that you, whatever it is that you do, any more than a professional soldier, or a self-defence expert for example, would necessarily be held to a higher standard of reasonable response in the heat of the moment than anyone else (not even the Secret Barrister himself, despite his specialist legal knowledge), as none of us can truly say how we would react in any given situation when faced with a threat in our homes. What the law seems to recognise is that our judgement can be flawed or even impaired in such a setting. Every case would be judged on its individual merits or lack thereof, and there’s no reason that I can see to believe that a normally highly rational recorder or a peace-loving preacher, for example, would necessarily respond any less (or more) reasonably than a police officer, say. Each is oft-tried and frequently sorely tested and any one of them may perhaps have returned home late in the evening after a long and difficult day only to discover an intruder in their home, and each might well be more easily ‘convinced’ than another member of ‘the general public’ that the intruder was likely to be armed or actually liable to use violence than someone else less used to hearing about and even seeing the effects of gratuitous violence on a daily basis. Indeed, a crime reporter or MP on the Justice Committee would probably be as well-acquainted with the ramifications of “householder” legislation as any of the above, but nothing in the law says that any of them are expected to behave more reasonably than anyone else when confronted with the blood-curdling reality of finding a burglar in their home. The real test, it seems, is whether their response (which it is recognised can be altered or even skewed by whatever complex set of emotions they experience in the heat of the moment) is “reasonable” and “proportionate” or tips over into the “unreasonable/(grossly) disproportionate” range. Such reactions are almost inevitably influenced by personal factors and such considerations as what they believe their personal abilities might enable them to respond in any particular set of circumstances (and may even be affected by – not necessarily “reasonable” – considerations such as how they might be judged by their colleagues if they took the path of least resistance for example). Any assessment as to whether the individual’s reaction was proportionate or (grossly) disproportionate, surely shouldn’t be made dependent on what the individual does professionally, any more than on who they are, because essentially I understand this to be about the degree to which it is permissible to accept some overstepping of the bounds of what might normally be considered a reasonable and sensible response to a given situation, because decisions taken in the heat of the moment are – by the nature of the specific circumstances of the invasion of one’s home (an “Englishman’s castle”) – more likely to result in mis- or ill-judged responses than those taken in the course of one’s professional duties, or in the absence of fear for the safety of one’s family, without necessarily becoming (grossly) disproportionate. I am glad, however, to learn that that the advice you receive on the job matches that so sagaciously dispensed by the Secret Barrister, but I am not convinced, on the scant basis of what you say, that your conclusion as regards your own position and that of others doing the same job can really be borne out. I remember a quote in the comment section of another blog that if the Mail said the sun was rising in the east, she would step outside to verify this. The final judgement in their libel case (http://bfms.org.uk/wp-content/uploads/2015/09/Shieldfield_Judgment.pdf) is an amazing. 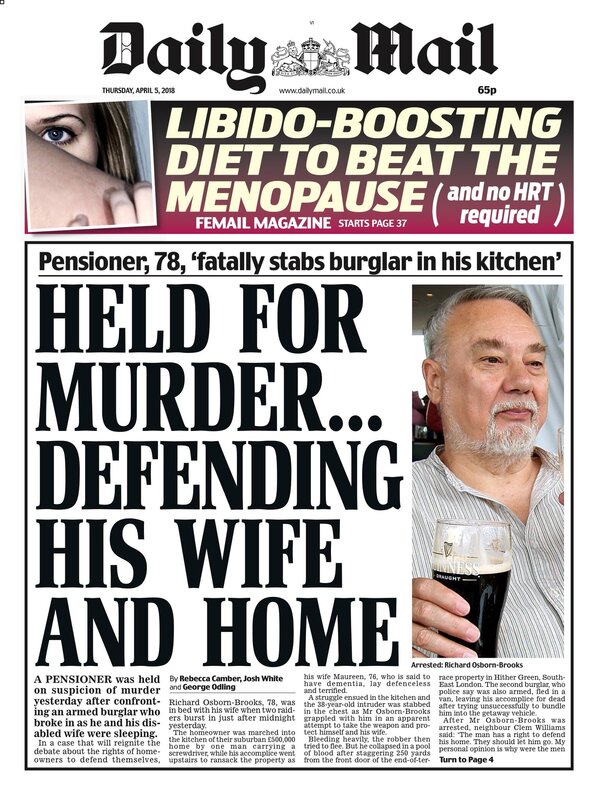 Whatever the legal niceties this incident risks bringing police relations with the public to a new low and it is no good blaming the tabloids they did not arrest and held a 78 year old man in custody for defending himself and his wife and acting as most of us would. Someone should have had the power and sense to stop it ever happening. It also makes it matter of record that they have been arrested for murder and had all their DNA taken and placed on the register (which I suspect is half the reason the police arrest people given half a chance – even if they have to release them without charge all their data remains on file), which will affect their lives in negative ways in the future. Someone who works with children and vulnerable adults may well find themselves out of a job, or unable to get another job in the same field, due to merely being arrested rather than charged, let alone found guilty. Being arrested and released without charge is not something that can be regarded as a neutral act by the police these days – it is in itself a punishment, given that many things now will take that fact and use it against you in the future (for example going on holiday to the US would require a visa if you have ever been arrested, regardless of being charged or not). Therefore arresting people who do not have a realistic chance of being charged is a de facto punishment. Incidentally are all police officers routinely arrested when they are involved in the death of a member of the public in some way when performing their duties? I’m still troubled by the necessity to arrest the individual. Assuming the householder is happy to be interviewed by the police under caution, what does arresting him add? You seem to be saying that he should be glad of being arrested because that gives him rights (eg free advice) which he wouldn’t otherwise get – is that the reason? The Kenneth Bassarath case (cricket bat killing), while not a burglary case is very alarming in terms of the application of self defence in the UK. Unless all the newspapers deliberately misled the public I cannot see how justice was served by incarcerating Mr. Bassarath. Great post, and thanks for the useful explanation. While I don’t live there, it’s good to have an idea of the local laws while traveling! How can we have on one hand a right to self defence, but on the other hand we are denied the legal right to own or possess any item specifically designed for self defence. Its given with one hand and taken away with other. lets consider that violent home intrusions are increasing, even in rural areas and the criminals like to target older or elderly people as they are likely to be wealthier. So you say that this 60 plus retired couple can defend themselves against one or more agressive often armed and frequently violent intruders, but HOW? when we are DENIED by LAW the right to own anything designed to be used as a weapon?